If you thought plasticuffs were the future of restraints, well, you might still be right. But handcuff technology is also preparing to fork in a much more high-tech direction. According to some recent patents, the future of handcuffs may be shocking. Literally. Shocking you. With electricity. 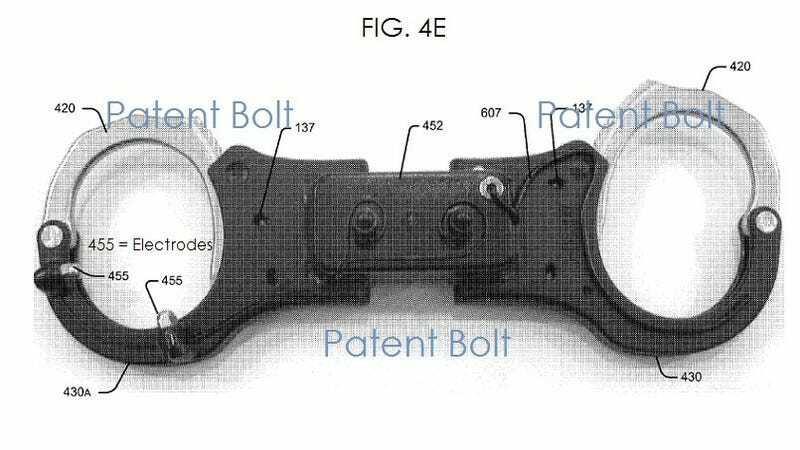 Dug up by Patent Bolt, the recent patent application from Scottsdale Inventions LLC shows what seems to be a pretty well developed prototype of handcuffs that will shock the wearer into submission. The patent also allows for a blinking light or auditory warning that triggers as the shock is prepared, presumably to warn the wearer to CALM DOWN. The shocks could come for any number of reasons—too much movement, movement outside a radius, or under order of the cuff's owner—and the cuffs would also contain EKG/ECG sensors to keep from shocking detainees a little too silly (i.e. to death).